Stakeholder forums are an excellent venue for helping local communities address complex, place-based, community revitalization challenges. Stakeholder forums can be an effective initial step for establishing partnerships, engaging with the community, and developing strategies for implementing revitalization projects. 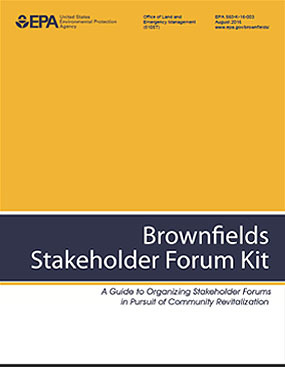 EMS developed a new Brownfields Stakeholder Forum Kit for EPA's Office of Brownfields and Land Revitalization to help communities design, plan and conduct forums that bring together groups of stakeholders to focus on a brownfields project. The kit walks users through a process for planning stakeholder forums that have a clear purpose, a strategically conceived agenda, and that are well-designed to solicit the participation and involvement of key stakeholders. The kit includes a list of planning activities, tips for choosing speakers and a facilitator, a model agenda, suggestions for handouts and visuals, lists of potential stakeholder groups to invite, and pointers on forum logistics, including managing registrations, room layouts, and audio visual equipment.